The existing Fenix 3 Sapphire multi-sport watches and the Fenix Chronos luxury smartwatch get three successors, all part of the same family, simply dubbed Fenix 5X, Fenix 5S, and Fenix 5. Garmin is one of the most popular brands when it comes to GPS and navigation devices, but they have been present on the wearable market for a while as well. After the recent luxury smartwatch known as Fenix Chronos and the well-known Fenix 3 Sapphire multi-sport watches, the company unveils three new watches at CES - the Fenix 5, Fenix 5S, and Fenix 5X. 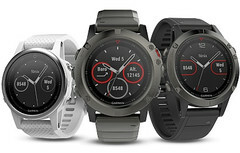 The highlights of the new Fenix smart wearables are similar since they are all rugged multisport GPS watches with basic connected features included as well. All of them feature GPS with GLONASS support, heart rate monitoring, a 3-axis compass, and more. The Garmin Fenix 5S was even named as an Innovation Awards Honoree in the wearable technologies category at CES. The sizes of these watches are 42 mm (Fenix 5S), 47 mm (Fenix 5), and 51 mm (Fenix 5S Sapphire). The prices are $599.99 USD for the Fenix 5 and 5X, while the Fenix 5S and Fenix 5S Sapphire both carry a price tag of $699.99 USD, although the later comes with an extra silicone QuickFit band and scratch-resistant sapphire lens. OLATHE, Kan.-Garmin International Inc., a unit of Garmin Ltd. (NASDAQ: GRMN), today announced fēnix 5, fēnix 5S and fēnix 5X, adding three watches designed with adventurers of all sizes in mind to its popular line of multisport GPS wearables. The fēnix 5S is lighter, sleeker and smaller than previous models – perfect for small wrists without sacrificing multisport functionality. The fēnix 5X boasts preloaded wrist-based mapping; and the compact fēnix 5, like other fēnix watches, is feature-packed and ready to take on any adventure with an all-new industrial design. All of the fēnix 5 models are 24/7 wearable with extended battery life, daily activity tracking1, Garmin Elevate™ wrist heart rate technology, and a host of connected features2. And users can easily switch between stylish leather and metal accessory bands to sporty silicone in seconds and without tools, thanks to the new QuickFit™ bands. With the new fēnix 5 lineup, users now have a watch that compliments their style and adventures. The first fēnix designed with a focus on female adventurers, the fēnix 5S is a sleek, smaller-sized watch. At 42mm, fēnix 5S is small and comfortable for petite wrists, without compromising any multisport features. Both stylish and functional, fēnix 5S is available in silver with either a white, turquoise or black silicone band with a mineral glass lens. The fēnix 5S Sapphire has a scratch-resistant sapphire lens and is available in black with a black band, champagne with a water resistant gray suede band or champagne with a metal band. The fēnix 5S Sapphire units also come with an extra silicone QuickFit band. In addition to the multiport features, the fēnix 5, 5S and 5X boast a variety of connected features. When paired with a compatible smartphone, users can get call, text and email smart notifications right on their wrist. All fēnix 5 models are compatible with Connect IQ so users can customize their watch with apps, widgets, data fields and watch faces. To take watch faces one step further, fēnix 5 watches are compatible with the Face It app, so users can set their favorite photo as their watch face. Sapphire models are Wi-Fi® Enabled, so users can connect their watch to their home network for automatic uploads to Garmin Connect™ when within range. Each of the new fēnix 5 models is water rated to 100 meters3, and is built to withstand the elements with a stainless steel bezel, buttons and rear case. The fēnix 5 can get up to two weeks of battery life in smartwatch mode and 24 hours in GPS mode. The fēnix 5X can get up to 12 days of battery life in smartwatch mode and 20 hours in GPS mode. The fēnix 5S can get up to eight days in smartwatch mode and up to 13 hours in GPS mode.4 Users can also take advantage of the UltraTrac™ power saver mode to extend battery life even more. The fēnix 5 is the latest solution from Garmin’s expanding outdoor segment, which focuses on developing technologies and innovations to enhance users’ outdoor experiences. Whether hiking, hunting, geocaching, golfing, or using satellite communication, Garmin outdoor devices are becoming essential tools for outdoor enthusiasts of all levels. For more information about Garmin’s other outdoor products and services, go to www.garmin.com/outdoors, www.garmin.blogs.com and twitter.com/garmin. Garmin International Inc. is a subsidiary of Garmin Ltd. (Nasdaq: GRMN). Garmin Ltd. is incorporated in Switzerland, and its principal subsidiaries are located in the United States, Taiwan and the United Kingdom. Garmin and fēnix are registered trademarks, and Garmin Elevate, QuickFit, UltraTrac and Garmin Connect are trademarks of Garmin Ltd. or its subsidiaries. Wi-Fi is a registered trademark of the Wi-Fi Alliance.